Walters Gardens, Inc. of Michigan registered this tissue culture sport of H. 'Krossa Regal' in 1987. It is a large size (30 inches high by 72 inches wide) mound of vase-shaped foliage with a cream margin. The leaves are ovate, slightly wavy, smooth textured and have thick substance. It has flower scapes up to 5 feet tall that bear medium lavender flowers from late July into August. It does not form seed pods. According to The Hostapedia by Mark Zilis (2009), this cultivar "...matures as a spectacular, vase-shaped mound of foliage but with variegation. 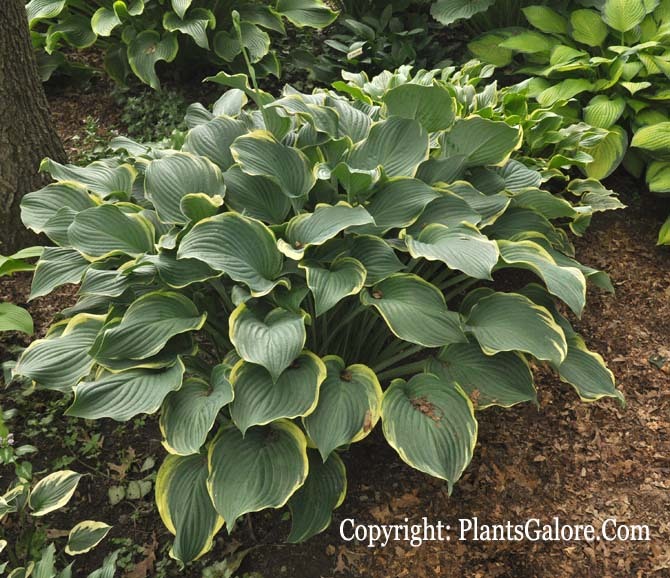 The width of the leaf margin varies from plant to plant..."
This cultivar has appeared on several of the Popularity Polls by members of The American Hosta Society. It was the 2003 "Hosta of the Year" by the American Hosta Growers Association.